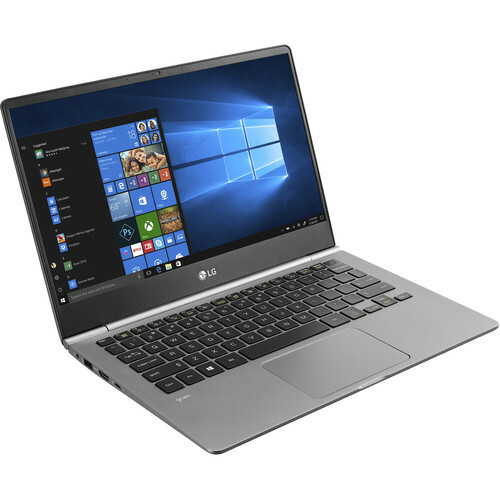 Thin and lightweight, the LG 13.3" gram Laptop provides both portability and performance. The 13.3" display has a Full HD 1920 x 1080 resolution and a 16:9 aspect ratio. The IPS panel provides wider viewing angles. Visuals are handled by integrated Intel UHD Graphics 620. You can also output video to an external display via HDMI. The system is powered by an 8th Gen Whiskey Lake 1.6 GHz Intel Core i5-8265U quad-core processor. It also has 8GB of 2400 MHz DDR4 RAM, a 256GB M.2 SSD, Wi-Fi 5 (802.11ac), Bluetooth 5.0, HDMI, a fingerprint reader, Thunderbolt 3, and USB 3.1 Gen 1 Type-A. Windows 10 Home (64-bit) is the installed operating system. The 13.3" display features a Full HD 1920 x 1080 resolution and a 16:9 aspect ratio. The IPS panel provides wider viewing angles. The screen also has multi-touch support. The system is powered by an 8th Gen Whiskey Lake Intel Core i5-8265U processor. Its quad cores can reach a stock speed of 1.6 GHz and be boosted up to 3.9 GHz. DTS Headphone: X provides you with virtual surround sound through a pair of headphones for an immersive listening experience. The gram is designed to be strong and has a US MIL-STD 810G rating for durability in low pressure (altitude), salt fog, high and low temperatures, sand and dust, vibration, humidity, and shock. Box Dimensions (LxWxH) 16.7 x 10.6 x 2.5"